Helensburgh is a bustling seaside town filled with restaurants, cafes and charity shops. 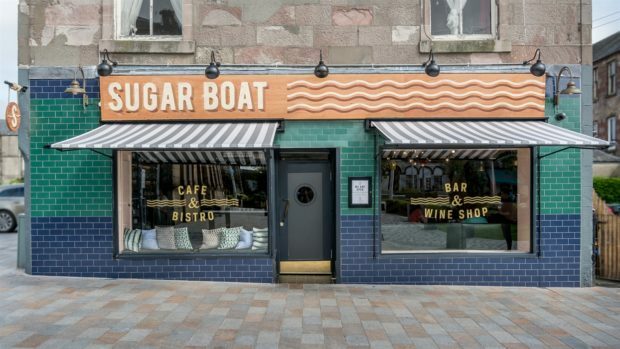 The Sugar Boat occupies a corner of smart Colquhoun Square. There is a free car park if you’re driving. A classy bistro that would not look out of place in the city. There is a buzz about the place. We are warmly welcomed at the door by the Sugar Boat owner who sees us to our table. Crayons and paper immediately appear for our five-year-old while we order our drinks. The staff are friendly and attentive. A range of meat and seafood dishes, seasonal veg and produce that are all sourced in Scotland. Mains include whole roast lemon and garlic chicken and beefburger with bacon, cheese, house pickle, lettuce & tomato with fries. As well as cocktails, they offer a choice of craft beers, gin and whisky. We kicked off with celeriac soup and pappardelle pasta in a beef ragu with grated Parmesan. The pasta was perfection in a rich tomato sauce and the soup was satisfyingly creamy. For mains, we opted for roast beef that melted in the mouth, and the pan-fried cod, charred broccoli and shrimp grenobloise. It was a nice hunk of flaky, delicious cod. We took a side order of triple-cooked fries as portion sizes weren’t huge. We shared the cheesecake mousse, poached plums and granola for dessert. Mains costs between £10 and £17 but the tempting beer and cocktails selection hiked the bill. Plush velvet dining booths and mid-century furnishings, with a nod to the art deco, creating a luxurious feel. The gorgeous art deco touches continue in the toilets with antique gold mirrors and vintage sinks, which are sparklingly clean. The Sugar Boat is named after the MV Captayannis, which capsized in 1974, spilling its cargo of sugar. You can still see its upturned hull off the coast of Helensburgh.